(ll. 36-52) Come thou, let us begin with the Muses who gladden the great spirit of their father Zeus in Olympus with their songs, telling of things that are and that shall be and that were aforetime with consenting voice. Unwearying flows the sweet sound from their lips, and the house of their father Zeus the loud-thunderer is glad at the lily-like voice of the goddesses as it spread abroad, and the peaks of snowy Olympus resound, and the homes of the immortals. And they uttering their immortal voice, celebrate in song first of all the reverend race of the gods from the beginning, those whom Earth and wide Heaven begot, and the gods sprung of these, givers of good things. Then, next, the goddesses sing of Zeus, the father of gods and men, as they begin and end their strain, how much he is the most excellent among the gods and supreme in power. And again, they chant the race of men and strong giants, and gladden the heart of Zeus within Olympus, -- the Olympian Muses, daughters of Zeus the aegis-holder. Then the son from his ambush stretched forth his left hand and in his right took the great long sickle with jagged teeth, and swiftly lopped off his own father's members and cast them away to fall behind him. And not vainly did they fall from his hand; for all the bloody drops that gushed forth Earth received, and as the seasons moved round she bare the strong Erinyes and the great Giants with gleaming armour, holding long spears in their hands and the Nymphs whom they call Meliae (8) all over the boundless earth. And so soon as he had cut off the members with flint and cast them from the land into the surging sea, they were swept away over the main a long time: and a white foam spread around them from the immortal flesh, and in it there grew a maiden. First she drew near holy Cythera, and from there, afterwards, she came to sea-girt Cyprus, and came forth an awful and lovely goddess, and grass grew up about her beneath her shapely feet. Her gods and men call Aphrodite, and the foam-born goddess and rich-crowned Cytherea, because she grew amid the foam, and Cytherea because she reached Cythera, and Cyprogenes because she was born in billowy Cyprus, and Philommedes (9) because sprang from the members. And with her went Eros, and comely Desire followed her at her birth at the first and as she went into the assembly of the gods. This honour she has from the beginning, and this is the portion allotted to her amongst men and undying gods, -- the whisperings of maidens and smiles and deceits with sweet delight and love and graciousness. (ll. 346-370) Also she brought forth a holy company of daughters (15) who with the lord Apollo and the Rivers have youths in their keeping -- to this charge Zeus appointed them -- Peitho, and Admete, and Ianthe, and Electra, and Doris, and Prymno, and Urania divine in form, Hippo, Clymene, Rhodea, and Callirrhoe, Zeuxo and Clytie, and Idyia, and Pasithoe, Plexaura, and Galaxaura, and lovely Dione, Melobosis and Thoe and handsome Polydora, Cerceis lovely of form, and soft eyed Pluto, Perseis, Ianeira, Acaste, Xanthe, Petraea the fair, Menestho, and Europa, Metis, and Eurynome, and Telesto saffron-clad, Chryseis and Asia and charming Calypso, Eudora, and Tyche, Amphirho, and Ocyrrhoe, and Styx who is the chiefest of them all. These are the eldest daughters that sprang from Ocean and Tethys; but there are many besides. For there are three thousand neat-ankled daughters of Ocean who are dispersed far and wide, and in every place alike serve the earth and the deep waters, children who are glorious among goddesses. And as many other rivers are there, babbling as they flow, sons of Ocean, whom queenly Tethys bare, but their names it is hard for a mortal man to tell, but people know those by which they severally dwell. (ll. 378-382) And Eos bare to Astraeus the strong-hearted winds, brightening Zephyrus, and Boreas, headlong in his course, and Notus, -- a goddess mating in love with a god. And after these Erigenia (16) bare the star Eosphorus (Dawn-bringer), and the gleaming stars with which heaven is crowned. Then the goddess through the love of the god conceived and brought forth dark-gowned Leto, always mild, kind to men and to the deathless gods, mild from the beginning, gentlest in all Olympus. Also she bare Asteria of happy name, whom Perses once led to his great house to be called his dear wife. And she conceived and bare Hecate whom Zeus the son of Cronos honoured above all. He gave her splendid gifts, to have a share of the earth and the unfruitful sea. She received honour also in starry heaven, and is honoured exceedingly by the deathless gods. For to this day, whenever any one of men on earth offers rich sacrifices and prays for favour according to custom, he calls upon Hecate. Great honour comes full easily to him whose prayers the goddess receives favourably, and she bestows wealth upon him; for the power surely is with her. For as many as were born of Earth and Ocean amongst all these she has her due portion. The son of Cronos did her no wrong nor took anything away of all that was her portion among the former Titan gods: but she holds, as the division was at the first from the beginning, privilege both in earth, and in heaven, and in sea. Also, because she is an only child, the goddess receives not less honour, but much more still, for Zeus honours her. Whom she will she greatly aids and advances: she sits by worshipful kings in judgement, and in the assembly whom she will is distinguished among the people. And when men arm themselves for the battle that destroys men, then the goddess is at hand to give victory and grant glory readily to whom she will. Good is she also when men contend at the games, for there too the goddess is with them and profits them: and he who by might and strength gets the victory wins the rich prize easily with joy, and brings glory to his parents. And she is good to stand by horsemen, whom she will: and to those whose business is in the grey discomfortable sea, and who pray to Hecate and the loud-crashing Earth-Shaker, easily the glorious goddess gives great catch, and easily she takes it away as soon as seen, if so she will. She is good in the byre with Hermes to increase the stock. The droves of kine and wide herds of goats and flocks of fleecy sheep, if she will, she increases from a few, or makes many to be less. So, then. albeit her mother's only child (17), she is honoured amongst all the deathless gods. And the son of Cronos made her a nurse of the young who after that day saw with their eyes the light of all-seeing Dawn. So from the beginning she is a nurse of the young, and these are her honours. (ll. 453-491) But Rhea was subject in love to Cronos and bare splendid children, Hestia (18), Demeter, and gold-shod Hera and strong Hades, pitiless in heart, who dwells under the earth, and the loud-crashing Earth-Shaker, and wise Zeus, father of gods and men, by whose thunder the wide earth is shaken. These great Cronos swallowed as each came forth from the womb to his mother's knees with this intent, that no other of the proud sons of Heaven should hold the kingly office amongst the deathless gods. For he learned from Earth and starry Heaven that he was destined to be overcome by his own son, strong though he was, through the contriving of great Zeus (19). Therefore he kept no blind outlook, but watched and swallowed down his children: and unceasing grief seized Rhea. But when she was about to bear Zeus, the father of gods and men, then she besought her own dear parents, Earth and starry Heaven, to devise some plan with her that the birth of her dear child might be concealed, and that retribution might overtake great, crafty Cronos for his own father and also for the children whom he had swallowed down. And they readily heard and obeyed their dear daughter, and told her all that was destined to happen touching Cronos the king and his stout-hearted son. So they sent her to Lyetus, to the rich land of Crete, when she was ready to bear great Zeus, the youngest of her children. Him did vast Earth receive from Rhea in wide Crete to nourish and to bring up. Thither came Earth carrying him swiftly through the black night to Lyctus first, and took him in her arms and hid him in a remote cave beneath the secret places of the holy earth on thick-wooded Mount Aegeum; but to the mightily ruling son of Heaven, the earlier king of the gods, she gave a great stone wrapped in swaddling clothes. Then he took it in his hands and thrust it down into his belly: wretch! he knew not in his heart that in place of the stone his son was left behind, unconquered and untroubled, and that he was soon to overcome him by force and might and drive him from his honours, himself to reign over the deathless gods. (ll. 590-612) For from her is the race of women and female kind: of her is the deadly race and tribe of women who live amongst mortal men to their great trouble, no helpmeets in hateful poverty, but only in wealth. And as in thatched hives bees feed the drones whose nature is to do mischief -- by day and throughout the day until the sun goes down the bees are busy and lay the white combs, while the drones stay at home in the covered skeps and reap the toil of others into their own bellies -- even so Zeus who thunders on high made women to be an evil to mortal men, with a nature to do evil. And he gave them a second evil to be the price for the good they had: whoever avoids marriage and the sorrows that women cause, and will not wed, reaches deadly old age without anyone to tend his years, and though he at least has no lack of livelihood while he lives, yet, when he is dead, his kinsfolk divide his possessions amongst them. And as for the man who chooses the lot of marriage and takes a good wife suited to his mind, evil continually contends with good; for whoever happens to have mischievous children, lives always with unceasing grief in his spirit and heart within him; and this evil cannot be healed. (ll. 687-712) Then Zeus no longer held back his might; but straight his heart was filled with fury and he showed forth all his strength. From Heaven and from Olympus he came forthwith, hurling his lightning: the bold flew thick and fast from his strong hand together with thunder and lightning, whirling an awesome flame. The life-giving earth crashed around in burning, and the vast wood crackled loud with fire all about. All the land seethed, and Ocean's streams and the unfruitful sea. The hot vapour lapped round the earthborn Titans: flame unspeakable rose to the bright upper air: the flashing glare of the thunder- stone and lightning blinded their eyes for all that there were strong. Astounding heat seized Chaos: and to see with eyes and to hear the sound with ears it seemed even as if Earth and wide Heaven above came together; for such a mighty crash would have arisen if Earth were being hurled to ruin, and Heaven from on high were hurling her down; so great a crash was there while the gods were meeting together in strife. Also the winds brought rumbling earthquake and duststorm, thunder and lightning and the lurid thunderbolt, which are the shafts of great Zeus, and carried the clangour and the warcry into the midst of the two hosts. An horrible uproar of terrible strife arose: mighty deeds were shown and the battle inclined. But until then, they kept at one another and fought continually in cruel war. (ll. 758-766) And there the children of dark Night have their dwellings, Sleep and Death, awful gods. The glowing Sun never looks upon them with his beams, neither as he goes up into heaven, nor as he comes down from heaven. And the former of them roams peacefully over the earth and the sea's broad back and is kindly to men; but the other has a heart of iron, and his spirit within him is pitiless as bronze: whomsoever of men he has once seized he holds fast: and he is hateful even to the deathless gods. (ll. 775-806) And there dwells the goddess loathed by the deathless gods, terrible Styx, eldest daughter of back-flowing (23) Ocean. She lives apart from the gods in her glorious house vaulted over with great rocks and propped up to heaven all round with silver pillars. 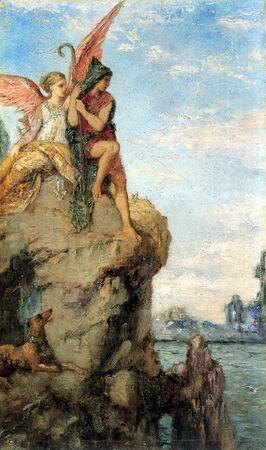 Rarely does the daughter of Thaumas, swift- footed Iris, come to her with a message over the sea's wide back. But when strife and quarrel arise among the deathless gods, and when any of them who live in the house of Olympus lies, then Zeus sends Iris to bring in a golden jug the great oath of the gods from far away, the famous cold water which trickles down from a high and beetling rock. Far under the wide-pathed earth a branch of Oceanus flows through the dark night out of the holy stream, and a tenth part of his water is allotted to her. With nine silver-swirling streams he winds about the earth and the sea's wide back, and then falls into the main (24); but the tenth flows out from a rock, a sore trouble to the gods. For whoever of the deathless gods that hold the peaks of snowy Olympus pours a libation of her water is forsworn, lies breathless until a full year is completed, and never comes near to taste ambrosia and nectar, but lies spiritless and voiceless on a strewn bed: and a heavy trance overshadows him. But when he has spent a long year in his sickness, another penance and an harder follows after the first. For nine years he is cut off from the eternal gods and never joins their councils of their feasts, nine full years. But in the tenth year he comes again to join the assemblies of the deathless gods who live in the house of Olympus. Such an oath, then, did the gods appoint the eternal and primaeval water of Styx to be: and it spouts through a rugged place. And there are shining gates and an immoveable threshold of bronze having unending roots and it is grown of itself (25). And beyond, away from all the gods, live the Titans, beyond gloomy Chaos. But the glorious allies of loud-crashing Zeus have their dwelling upon Ocean's foundations, even Cottus and Gyes; but Briareos, being goodly, the deep-roaring Earth-Shaker made his son-in-law, giving him Cymopolea his daughter to wed.
(ll. 820-868) But when Zeus had driven the Titans from heaven, huge Earth bare her youngest child Typhoeus of the love of Tartarus, by the aid of golden Aphrodite. Strength was with his hands in all that he did and the feet of the strong god were untiring. From his shoulders grew an hundred heads of a snake, a fearful dragon, with dark, flickering tongues, and from under the brows of his eyes in his marvellous heads flashed fire, and fire burned from his heads as he glared. And there were voices in all his dreadful heads which uttered every kind of sound unspeakable; for at one time they made sounds such that the gods understood, but at another, the noise of a bull bellowing aloud in proud ungovernable fury; and at another, the sound of a lion, relentless of heart; and at anothers, sounds like whelps, wonderful to hear; and again, at another, he would hiss, so that the high mountains re-echoed. And truly a thing past help would have happened on that day, and he would have come to reign over mortals and immortals, had not the father of men and gods been quick to perceive it. But he thundered hard and mightily: and the earth around resounded terribly and the wide heaven above, and the sea and Ocean's streams and the nether parts of the earth. Great Olympus reeled beneath the divine feet of the king as he arose and earth groaned thereat. And through the two of them heat took hold on the dark-blue sea, through the thunder and lightning, and through the fire from the monster, and the scorching winds and blazing thunderbolt. The whole earth seethed, and sky and sea: and the long waves raged along the beaches round and about, at the rush of the deathless gods: and there arose an endless shaking. Hades trembled where he rules over the dead below, and the Titans under Tartarus who live with Cronos, because of the unending clamour and the fearful strife. So when Zeus had raised up his might and seized his arms, thunder and lightning and lurid thunderbolt, he leaped form Olympus and struck him, and burned all the marvellous heads of the monster about him. But when Zeus had conquered him and lashed him with strokes, Typhoeus was hurled down, a maimed wreck, so that the huge earth groaned. And flame shot forth from the thunder- stricken lord in the dim rugged glens of the mount (26), when he was smitten. A great part of huge earth was scorched by the terrible vapour and melted as tin melts when heated by men's art in channelled (27) crucibles; or as iron, which is hardest of all things, is softened by glowing fire in mountain glens and melts in the divine earth through the strength of Hephaestus (28). Even so, then, the earth melted in the glow of the blazing fire. And in the bitterness of his anger Zeus cast him into wide Tartarus. (ll. 881-885) But when the blessed gods had finished their toil, and settled by force their struggle for honours with the Titans, they pressed far-seeing Olympian Zeus to reign and to rule over them, by Earth's prompting. So he divided their dignities amongst them. (ll. 924-929) But Zeus himself gave birth from his own head to bright-eyed Tritogeneia (29), the awful, the strife-stirring, the host-leader, the unwearying, the queen, who delights in tumults and wars and battles. But Hera without union with Zeus -- for she was very angry and quarrelled with her mate -- bare famous Hephaestus, who is skilled in crafts more than all the sons of Heaven. (ll. 929a-929t) (30) But Hera was very angry and quarrelled with her mate. And because of this strife she bare without union with Zeus who holds the aegis a glorious son, Hephaestus, who excelled all the sons of Heaven in crafts. But Zeus lay with the fair- cheeked daughter of Ocean and Tethys apart from Hera.... ((LACUNA)) ....deceiving Metis (Thought) although she was full wise. But he seized her with his hands and put her in his belly, for fear that she might bring forth something stronger than his thunderbolt: therefore did Zeus, who sits on high and dwells in the aether, swallow her down suddenly. But she straightway conceived Pallas Athene: and the father of men and gods gave her birth by way of his head on the banks of the river Trito. And she remained hidden beneath the inward parts of Zeus, even Metis, Athena's mother, worker of righteousness, who was wiser than gods and mortal men. There the goddess (Athena) received that (31) whereby she excelled in strength all the deathless ones who dwell in Olympus, she who made the host-scaring weapon of Athena. And with it (Zeus) gave her birth, arrayed in arms of war. (ll. 940-942) And Semele, daughter of Cadmus was joined with him in love and bare him a splendid son, joyous Dionysus, -- a mortal woman an immortal son. And now they both are gods. (ll. 963-968) And now farewell, you dwellers on Olympus and you islands and continents and thou briny sea within. Now sing the company of goddesses, sweet-voiced Muses of Olympus, daughter of Zeus who holds the aegis, -- even those deathless one who lay with mortal men and bare children like unto gods. (ll. 969-974) Demeter, bright goddess, was joined in sweet love with the hero Iasion in a thrice-ploughed fallow in the rich land of Crete, and bare Plutus, a kindly god who goes everywhere over land and the sea's wide back, and him who finds him and into whose hands he comes he makes rich, bestowing great wealth upon him. (ll. 1011-1016) And Circe the daughter of Helius, Hyperion's son, loved steadfast Odysseus and bare Agrius and Latinus who was faultless and strong: also she brought forth Telegonus by the will of golden Aphrodite. And they ruled over the famous Tyrenians, very far off in a recess of the holy islands. (1) The epithet probably indicates coquettishness. (3) `She of the noble voice': Calliope is queen of Epic poetry. (4) Earth, in the cosmology of Hesiod, is a disk surrounded by the river Oceanus and floating upon a waste of waters. It is called the foundation of all (the qualification `the deathless ones...' etc. is an interpolation), because not only trees, men, and animals, but even the hills and seas (ll. 129, 131) are supported by it. (5) Aether is the bright, untainted upper atmosphere, as distinguished from Aer, the lower atmosphere of the earth. (6) Brontes is the Thunderer; Steropes, the Lightener; and Arges, the Vivid One. (7) The myth accounts for the separation of Heaven and Earth. In Egyptian cosmology Nut (the Sky) is thrust and held apart from her brother Geb (the Earth) by their father Shu, who corresponds to the Greek Atlas. (8) Nymphs of the ash-trees, as Dryads are nymphs of the oak- trees. Cp. note on "Works and Days", l. 145. (9) `Member-loving': the title is perhaps only a perversion of the regular PHILOMEIDES (laughter-loving). (11) Many of the names which follow express various qualities or aspects of the sea: thus Galene is `Calm', Cymothoe is the `Wave-swift', Pherusa and Dynamene are `She who speeds (ships)' and `She who has power'. (12) The `Wave-receiver' and the `Wave-stiller'. (13) `The Unerring' or `Truthful'; cp. l. 235. (15) Goettling notes that some of these nymphs derive their names from lands over which they preside, as Europa, Asia, Doris, Ianeira (`Lady of the Ionians'), but that most are called after some quality which their streams possessed: thus Xanthe is the `Brown' or `Turbid', Amphirho is the `Surrounding' river, Ianthe is `She who delights', and Ocyrrhoe is the `Swift-flowing'. (16) i.e. Eos, the `Early-born'. (17) Van Lennep explains that Hecate, having no brothers to support her claim, might have been slighted. (18) The goddess of the hearth (the Roman "Vesta"), and so of the house. Cp. "Homeric Hymns" v.22 ff. ; xxxix.1 ff. (19) The variant reading `of his father' (sc. Heaven) rests on inferior MS. authority and is probably an alteration due to the difficulty stated by a Scholiast: `How could Zeus, being not yet begotten, plot against his father?' The phrase is, however, part of the prophecy. The whole line may well be spurious, and is rejected by Heyne, Wolf, Gaisford and Guyet. (20) Pausanias (x. 24.6) saw near the tomb of Neoptolemus `a stone of no great size', which the Delphians anointed every day with oil, and which he says was supposed to be the stone given to Cronos. (21) A Scholiast explains: `Either because they (men) sprang from the Melian nymphs (cp. l. 187); or because, when they were born (? ), they cast themselves under the ash-trees, that is, the trees.' The reference may be to the origin of men from ash-trees: cp. "Works and Days", l. 145 and note. (22) sc. Atlas, the Shu of Egyptian mythology: cp. note on line 177. (23) Oceanus is here regarded as a continuous stream enclosing the earth and the seas, and so as flowing back upon himself. (24) The conception of Oceanus is here different: he has nine streams which encircle the earth and the flow out into the `main' which appears to be the waste of waters on which, according to early Greek and Hebrew cosmology, the disk-like earth floated. (25) i.e. the threshold is of `native' metal, and not artificial. (26) According to Homer Typhoeus was overwhelmed by Zeus amongst the Arimi in Cilicia. Pindar represents him as buried under Aetna, and Tzetzes reads Aetna in this passage. (27) The epithet (which means literally `well-bored') seems to refer to the spout of the crucible. (28) The fire god. There is no reference to volcanic action: iron was smelted on Mount Ida; cp. "Epigrams of Homer", ix. 2-4. (30) Restored by Peppmuller. 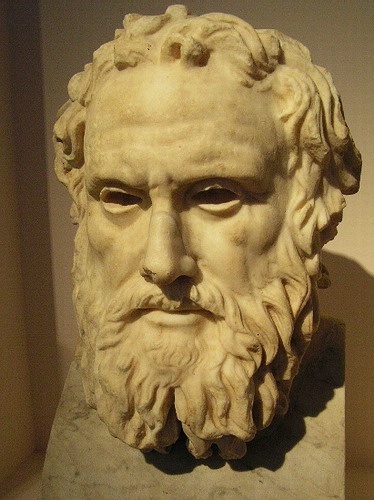 The nineteen following lines from another recension of lines 889-900, 924-9 are quoted by Chrysippus (in Galen). (31) sc. the aegis. Line 929s is probably spurious, since it disagrees with l. 929q and contains a suspicious reference to Athens.